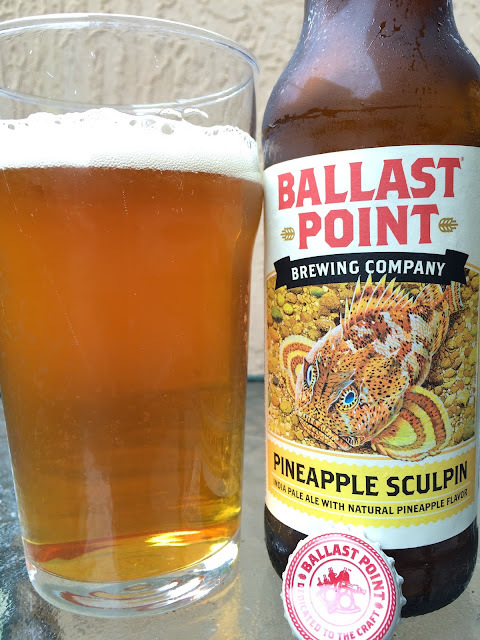 I decided to check out Pineapple Sculpin today. Ballast Point Brewing has been riding the treatment wave of its flagship Sculpin IPA. I've tried and enjoyed Grapefruit Sculpin but had different thoughts on Habanero Sculpin. Pineapples, however, seem to be more up my alley from a conception standpoint. Label is the same, just with a golden yellow hue. 7.0% alcohol. Big fruity aroma immediately upon opening the bottle. Orange, tangerine, just a simple whiff of pineapple. Flavors are similar starting with lots of orange citrus, flowers and dried fruit. After a few sips, a touch of sweet tropical pineapple seems to inject itself into the picture, just enough to add a subtle twist to an already great beer. Very juicy, fruity and nice balance between sweet and bitter pine and spicy hops. Alcohol dryness comes at the finish as well. And while pineapple gives just a mere kiss throughout, those flavors linger the most in the aftertaste. Very interesting. I liked it! It sounds nice when beer accompanied with and seasonal fruit. I just wonder how it taste like. It looks yummy though but still there is a need to taste some sip.